Get Set For Easter Sale Is On NOW! 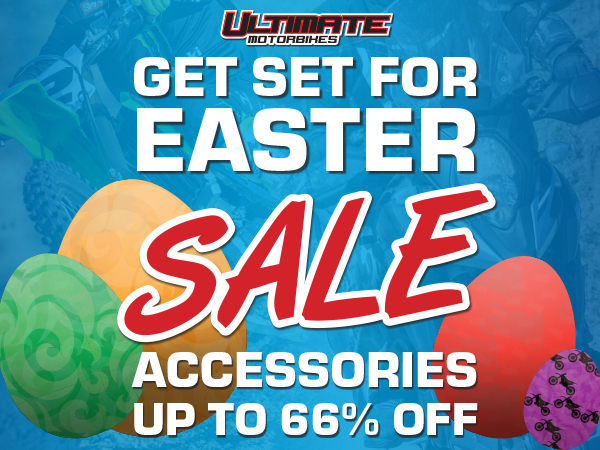 The ULTIMATE riding long weekend is nearly here, so GET SET FOR EASTER at Ultimate Motorbikes! Check out our fully-loaded catalogue online with deals on parts and accessories for you to drool over! Save up to 66% on your favourite gear, whether you ride on or off-road, or maybe a bit of both - we've got you covered. With Easter just around the corner, we know you've got a lot of spirited riding ahead of you, so this is the PERFECT opportunity to gear up (or upgrade your bike) before your next run up the mountain or tearing up those trails! We're also proud to offer ZipMoney in-store so you can grab the gear you want, and pay it off interest-free! Ride Now, Pay Later - how good does that sound? Take a peek at our catalogue and get into your closest Ultimate Motorbikes store & SAVE! PRODUCT OF THE MONTH - CARDO FREECOM 4+ NEW PRODUCT: METZELER CRUISETEC TYRES APRILIA RSV4 AND TUONO V4 1100 FACTORY ARRIVING SOON RECEIVE $2000 IN FREE ACCESSORIES ON POLARIS RANGER XP 1000 Royal Enfield OneRide 2019 MV AGUSTA 2018 DEMO CLEARANCE SUZUKI ECSTAR's Alex Rins Claims First Ever MotoGP Victory at COTA SAVE UP TO $1,200 ON KTM'S MY19 EXC RANGE YAMAHA - R3 Guaranteed Trade Kawasaki Ninja 400 - TRADE @ WHAT YOU PAID GUARANTEED! Get Set For Easter Sale Is On NOW! 2019 YAMAHA YZF-R3 IS HERE SAVE UP TO $1,000 ON THE KAWASAKI AG RANGE PRODUCT OF THE MONTH: OGIO 2019 GSX-R750 - Simply Unbeatable Value ROYAL ENFIELD 2018 PLATE CLEARANCE MV AGUSTA 2018 PLATE CLEARANCE & LOW RATE FINANCE* NEW 2019 YAMAHA WR450F HAS ARRIVED! 0% FINANCE OFFER ON POLARIS ACE 570 HD 2019 Aprilia Tuono V4 1100 RR and Factory Ready To Touch Down In Australia! NEW 2019 KAWASAKI VERSYS 1000 SE & RIDEOLOGY MOTO GUZZI V7 111 - FREE REGISTRATION & CTP KTM's Exciting All -New 790 Adventure Models MOTO GUZZI EXPERIENCE 2019 Yamaha Tracer 900GT KTM'S ULTIMATE RACE MY19 GSX-S1000 - Own The Street The Covers Are Off The NEW MV Agusta Turismo SCS RC! Polaris Awarded Australia's Number 1 Off-Road Vehicle Brand Kawasaki's Classic Range Grows With The Kawasaki W800 Cafe Suzuki Katana Available for Pre-Order Ultimate KTM Race Ready SX & EXC Service Special The 2019 Polaris Outlaw 110 Has Landed NEW Royal Enfield 650cc Twins! KTM 2019 450 SX-F Factory Edition Unveiled Suzuki's popular fun ATV, the QuadSport Z90 Moto Guzzi 2019 V7 III Stone Night Pack Justin Barcia Defies Conditions To Conquer Anaheim 1 Kawasaki Supersport Specials and MY19 Models EICMA 2018 - Most Beautiful Motorcycle Award Aprilia Unveils Concept RS 660 At EICMA! 2019 KTM AUSTRALIA ADVENTURE RALLYE TASMANIA MV Agusta F4 Claudio - The Most Extraordinary Bike Yet. Ultimate Now Stocking Metzeler SAVE $1,300 ON NEW APRILIA MODELS RUMBLER 350 - Voted Best LAMS Cruiser FIRST LOOK - MOTO GUZZI V85 TT Kawasaki Merchandise Available Now! LIMITED EDITION MV AGUSTA DRAGSTER 800 RR PIRELLI The Suzuki Katana Returns in 2019! Kawasaki Reveal Three New ZX-10R Models For 2019 Suzuki's NEW 2019 RM-Z250 Announced KTM 250 SX Turns Up The Heat In 2019 Moto Guzzi Launches The V9 Bobber Sport 2019 O'NEAL MX GEAR AVAILABLE NOW! All new Yamaha Grizzly EPS released Redding Out, Iannone In + Biaggi To Become Aprilia Ambassador WIN The Ultimate Arai Helmet Of Your Choice!